Traveling with PACE is like traveling with your family, your best friend, your college buddies, or even your former roommate. It’s all of those things, and more! And it all took place in November on the 2011 Rhine River Cruise as 130 of us took over a cruise ship to sail down the river for a week. From twenty-somethings to eighty-somethings, we ate, learned, laughed, and explored the river stops and sights from the Netherlands to Switzerland. Captain Hank (our experienced river captain) said we were the best bunch he had ever sailed with! Cruising like this is never boring and keeps you moving from early morning breakfast to the late night snacks. Of course, if you want to sleep in, bicycle the local town at your leisure, or find shopping side trips, the cruise director can make that happen. But few of us opted to sleep in. Most were up early, ready to explore and hike the port stops not only during the day but even after dinner, like in the romantic, lighted town of Koblenz, Germany. 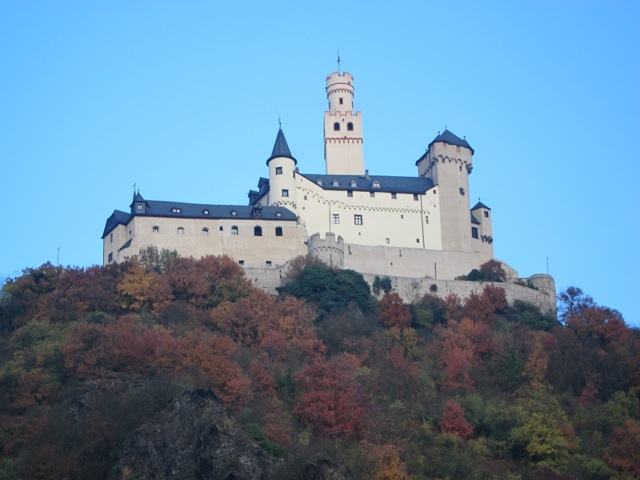 At Marksburg, we hiked up a hill to explore a twelfth-century castle that had never been destroyed. We saw the defenses, armor, and indoor plumbing of the Middle Ages! Other favorite stops included the Gutenberg Museum in Mainz, to see the movable type and Bible that started the Protestant Reformation, and Strasbourg, where a branch of the European Parliament sits alongside a picturesque town that begs one to deposit some tourist euros. Visiting cathedrals in Germany at Köln (known in French as Cologne) and Worms offered outstanding reminders of Gothic and Romanesque architecture, but equally thrilling were stops at very old synagogues in Germany. Our visit to one small, impressive, still-functioning congregation was a particular treat on the anniversary of Krystal Nacht, the fateful night when Nazi Germany struck Jewish congregations across the Rhineland. We were constantly learning, in part through wonderful on-board lectures by Principia faculty in art, literature, religious history, and contemporary European politics. Each day was enriched by listening to lectures and then exploring what we had heard, or cruising through the breathtaking Rhine Gorge while hearing about the myths and legends of the Lorelei and Niebelungs. There’s something for everyone in these trips, whether it’s the on-board fellowship with other Christian Scientists, gathering together for inspiring church services, or making new friends among the varied participants—from retired Marine Corps officers to dynamic women entrepreneurs to European citizens who told of living in Nazi-occupied Netherlands and France during the war. I came home with incredible memories of the scenes before me for a week, but even more so with a love for the family I traveled with. See a slideshow and testimonials from the cruise.